Many serious wine enthusiasts I know prefer drinking red wine all year, so when temperatures start dipping, there’s no doubt that they are looking for a real powerhouse. 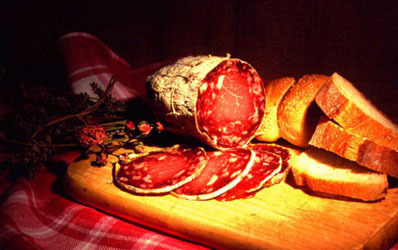 A fine place to begin your search is the Piedmont region of Italy. 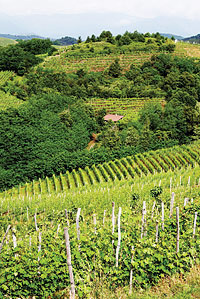 Piedmont is the largest region on the Italian mainland but produces the least amount of wine. What is produced is amazing; excellent for collectors because many require aging. My favorite, and much loved by everyone, is Barolo. Barolo is known as the “wine of kings and king of wine.” They are truly some of the finest red wines in Italy, perhaps even the world. Barolo is a Classified DOCG (Denominazione di Origine Controllata e Garantita), which represents the highest level of quality in Italian wines, and with its geography so close to Burgundy, France, it is no surprise. To appreciate Barolo, you must first understand the region, the growing conditions, and the Nebbiolo grape. Piedmont (which means “foot of the mountains”) is close to the Alps—surrounding the wine-growing areas on three sides, amidst the steep rolling hills. 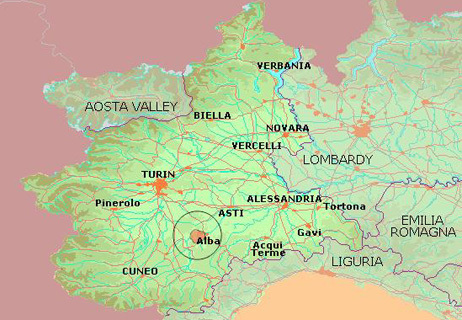 In the southwest area of Piedmont, you will find Alba, located on the Langhe hillsides next to several tiny villages—one with the name Barolo. This is the area where the Nebbiolo grape grows with intensity—in fact, Piedmont is the only region that the Nebbiolo grape excels, showing an expression of the terroir that makes the wine so special. The Nebbiolo grape (nebbia meaning “fog”) that produces Barolo is very challenging to grow, but surprisingly does exceptionally well planted in Piedmont where the climate conditions include very cool damp winters, followed by long hot summers. Needing lots of sunshine, Nebbiolo is harvested late in the season. This creates wines that have high acid and strong tannins–two of the desired characteristics of Barolo. After harvesting, Barolo must be aged for three years in the barrel and bottle before being released (by DOCG law) and four years for Barolo reserve. Barolo is a well-balanced, rich, robust, full-bodied, and elegant red wine—defined as a “powerhouse.” The wines can be hard to find and pricey, but well worth the search and cost. My choices for top Barolo producers are: Ascheri, Ceretto, Fontanafredda, Gaja, Luigi Baudana, Pio Cesare, Prunotto, and Renato Ratti. In addition to Barolo, the Nebbiolo grape is also used to make Barbaresco, Gattinara, and Nebbiolo (on its own). Other grape varietals and wines found in Piedmont are Dolcetto, Barbera, and Verduno Pelaverga—all priced less and are lighter, making them appealing everyday wines. Barolo needs to be served with food. Piedmont is known for fabulous food, and its local food products are equally superlative with this wine—complementing one another with their styles and distinctiveness. This is the region where white truffles are found and some of the best chocolate in the world is produced—both are wonderful matches with Barolo. Although Piedmont is highly respected for its rich reds, it is also an excellent region for whites—Spumante (the famous Asti is here), Arneis, and Moscato—a sweet dessert wine. The region is a great destination for exploring these wines. Consider visiting the city of Torino for a few days, then head in to wine country. Be sure to visit Alba, Asti, Barolo, Barberesco, Bra (home of the Slow Food movement), La Morra, Saluzzo, and Serralunga—to name just a few. Piedmont is a great location!